Since I wrote Leadership From Below in 2008, there has been a steady flow of management books about bottom-up leadership. 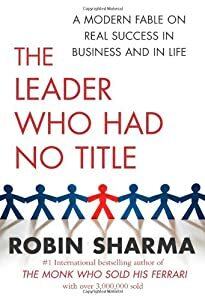 In The Leader Who Had No Title (2010), speaker Robin Sharma has put together a modern fable on success in business and in life. There are no revolutionary insights in this book, but its speaks to the frustrated, overworked American, which seems to be in the majority. Sharma also avoids being too patronizing. Instead of the traditional format he chooses a narrative form, which incidentally, means that instead of offering any kind of evidence, we are asked to trust the experience of the author indirectly. We follow Blake, an uninspired worker who is presented with the chance to meet four somewhat unlikely leadership teachers in one day, a maid who is deeply passionate about her job, a surfer and skier who says to lean in on the steep slopes, seek out and face danger head on, a former CEO now passionate about gardening who explains that business is all about relationships, and a shoe shiner who says you need to be a great person to be a great leader. All are lessons that ring true in the postmodern leadership scene where results only come if you balance your pursuits so that life and work mesh together. All those things we believed were so important, things like titles, net worth and social position turn out to be so very unimportant. As I predicted several years ago, it seems like the Zen of everyday life is becoming key to the western man and woman’s quest to reinvent reality. Sharma seems to confuse leadership with mere exemplary work. He depicts leadership as a matter not of heading a team or directing change but simply of focusing on excellence in the work you do. Rather, leadership from below, which is more an attitude to life regardless of your various roles, becomes important even as hierarchies matter. So, both Sangeeth and Robin are right: whatever you do, only take the lead if you mean it. The leader is one in which the others can be confident that their work will lead to success or meet targets under the circumstances. The leader and skipped the step that should demonstrate excellence but strives to maintain it.